I am positively crazy about meditation these days. Allow me to explain a little here. This year, one of my BIG resolutions was to meditate daily with little to no exceptions. 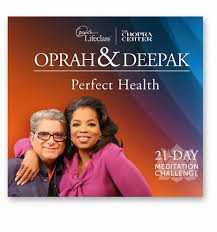 I have done a really good job following through on my daily practice and THEN this summer, I saw that Oprah and Deepak Chopra were teaming up for a relationship orientated meditation challenge. Next thing I knew, my mom, my mother-in-law and myself were all doing the free challenge and really enjoying the meditative program. Little did I know that once the program ended, I would be left to muddle through unguided meditations and it would leave me jonesing for some Deepak. A little less than a month ago, I broke down and bought the three program meditation challenge package. I'm addicted to Deepak Chopra and I don't care who knows it! First up? I did the Perfect Health meditative challenge. Health is something I have been really focusing on in my personal life and it seemed like the perfect program to start with. I loved this program. It allowed me to think about the state of my health, the ways in which I could improve it, and most of all, it gave me those 16 precious minutes each day to practice meditation and rejuvenate my body and soul. That is what I love most about these programs: they force you to set aside time for yourself and by the end, you just feel so good. **This is NOT a paid opinion. I just genuinely like the program and thought y'all should know about it. All opinions expressed are my own, bossy ones. Over and out!